Five including four leaders of Chhatra League and one Juba League men were killed in a road accident on Rupsa Bridge Bypass road on Sunday night, reports BSS. of sadar upazila unit BCL and Saju Ahmed, BCL leader. 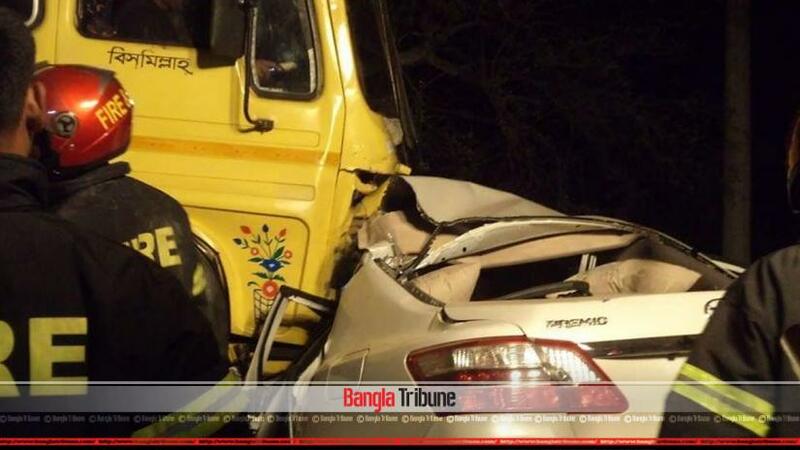 The accident took place when a car carrying the leaders collided head-on with a truck in front of Labonchara police station in the city at around 10:45 pm leaving five dead on the spot, said Md Shafiqul Islam, Officer in Charge (OC) of Labanchara Police Station. A cement laden truck (Dhaka Metro Ta-18-2584) was coming from Mongla Cement Factory area and was going towards Rupsha area while the private car was going to Gopalganj from city’s zero point, said OC. The accident occurred while the driver (Jubo League leader) of the private car lost control over the wheel as a pedestrian probably mentally disabled came in front the car, OC said, adding that the speedy truck collided head-on with the car. The truck driver managed to flee from the spot, he said. On information, fire service teams rushed to the spot and recovered the five men from the smashed car and send them to KMCH morgue for autopsy. The bodies were handed over to the family members of the BCL-Jubo League men in the morning.